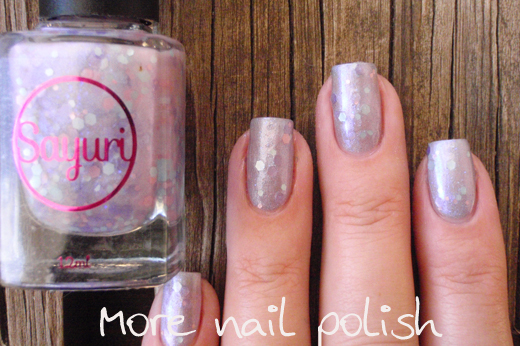 More polishes from Aussie indie brand Sayuri tonight following on from Mizurio and OShare that I showed last week. First up is the base polish I applied my Sayuri polishes over. This is Layla Softouch Effect polish in Stone. It's a soft and velvety matte finish polish that I picked up recently during the Ozsale Layla sale. Application was flawless and I can't wait to wear the other two colours I purchased as well (especially the beautiful soft gold!!). 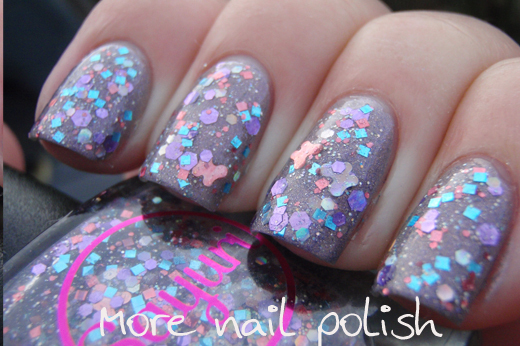 Fairy Kei - this polish could be worn on it's own at about three coats, as it has a heavy shimmer that would achieve opacity. 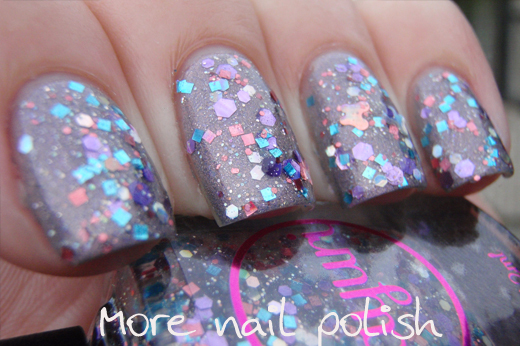 It also contain matte aqua, lavender, and pink hexes of varying sizes, along with tiny iridescent purple glitters. The strong shimmer tends to lean this a little frosty, but the glitters still show through nicely and don't look bumpy, as can often happen with shimmer/glitter combos. Love, Sayuri - This one is without a doubt my favourite from the collection. These photos don't do it any justice because it was just so perfectly glittery and pretty in real life. Love, Sayuri is a special edition polish made for the launch of Sayuri lacquer, so I don't know how long this one might be around for. 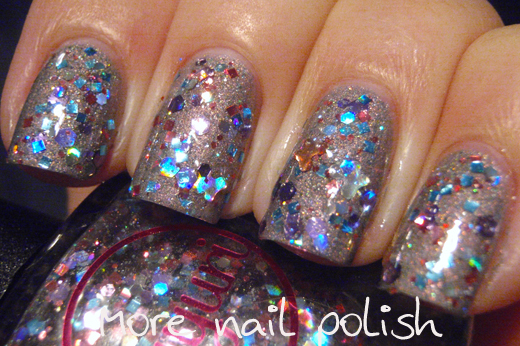 Love Sayuri has a clear base and contains 10 different coloured holographic glitters. Rose pink, purple, and silver hexes of varying sizes, rose pink and turquoise blue squares, and rose pink and silver butterflies. I tried to capture some of the pretty holo goodness of this polish under my bathroom light, but it in no way compares to how this one looked on my nails. I love this polish so much! Sayuri Nail Lacquer are currently having a mothers day sale and have 20% of all her polishes, bringing them down to $7.96. 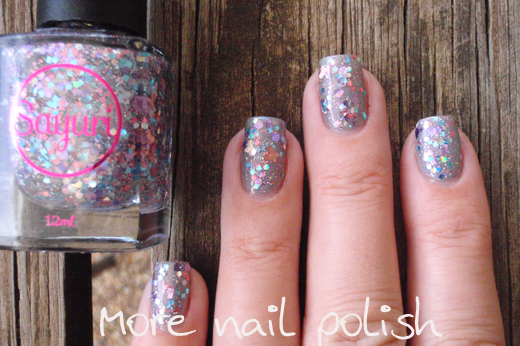 They are available through the Sayuri Nail Lacquer website. Wow, I really like Love, Sayuri! 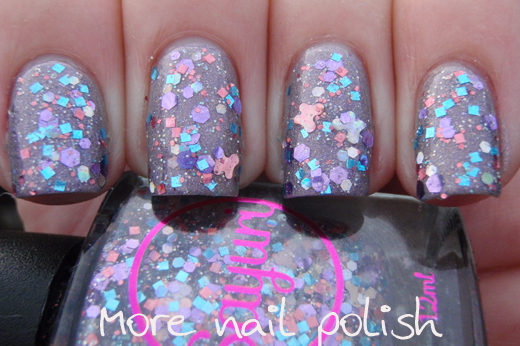 The glitters are pretty, but what I like most in this post is the base colour. The texture looks SO velvety! Sorry if you have covered this already. Your mani's look so perfect, professional, neat and clean. 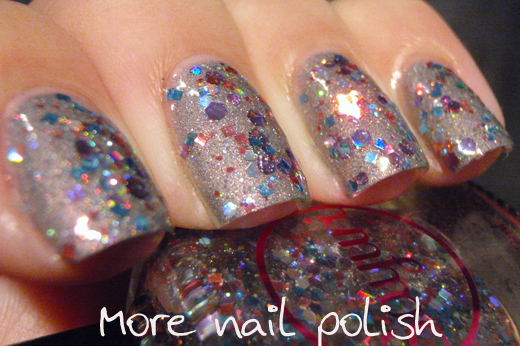 The main thing I want to know is how do you make your nail polish last and not chip? Are your nails natural? If you could help me, I do appreciate it very much. Thanks so much Cathy, I'm so glad you loved Love, Sayuri. It's definitely one of my favourites too!